I was born on November 10th, 1996, that makes me 21 years old. What does your artist name Fiphie mean? 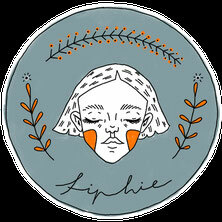 Fiphie (pronounced: FeeFee) originates from my birth name Sophie. My mother nicknamed me Fiphie since I was little and it has stayed with me ever since. Basically since I can remember. My family was always very encouraging which really helped me to stay motivated and feel confident in pursuing what I love doing. I started writing at age eight when my dad handed down his old computer to me, which had this super simple text program on it. I started writing my own stories which were about friendships and girls playing soccer. Later I fell in love with poetry, the topics changed, got more serious and matured, but my passion for writing remained. How did you become comfortable sharing your work with other people? When I started sharing my art and poetry publicly on Instagram I barely had any followers (around six, I think). So it wasn’t too big of a jump in at the deep end. As my account grew and people were reacting positively to my work, I gained more confidence and got more comfortable with being open with strangers. I guess I could describe myself on the one hand as a very outgoing person who laughs a lot and enjoys being among people, on the other hand I can be quite an introvert too, needing time and space to think and ponder, and to recharge my batteries. I believe the mix of both traits is what constitutes my work. I tend to observe people a lot, how their minds work, what shakes them, what makes them fear or love life. I, myself, am very much afraid of death and everything that comes with losing control. So I engage myself in these issues a lot and believe my art and poetry greatly reflect these thoughts and therefore my personality. Oh, yes! It definitely has changed. Unfortunately I can’t remember every step of how I found my style. It was a long, evolving process and I think it will never stop changing and growing. One thing that really helped me in the beginning was to start with less realistic drawings of people to get a feel for proportions and features of the human face (same goes for anything else I wanted to commit to paper). The more realistically I tried to create something, the more frustrated I got if something didn’t turn out the way I wanted it to. Does your heritage/ background influence your work at all? I was born and raised in Upper Bavaria, Germany. Surrounded by the Bavarian Alps, many rivers, trees, and flowers, I have always felt a strong connection to nature. In a lot of my artwork elements of my environment (mountains and an abundance of flowers!) can be found. Heritage wise I don't think it influences my work in a way that it differentiates too much from someone with a different background. Actually, isn't almost everything we are feeling and thinking universal? I guess that is what makes my work relatable to so many others. Although we all follow our own path in life, at times we still have to go through the same things. And isn't it sometimes just easier to walk through them together? Good question, actually. I guess it can be found anywhere, I just have to keep my eyes and heart open. - watching strangers pass by while sitting on the edge of a fountain, eating ice cream. Do you ever struggle with writer’s/artist’s block? Of course I do! Who doesn’t? How do I overcome writer’s/artist’s block? Oh, if I only had the answer! For me what works best is to just let things be and stop worrying that I can’t think of anything good. If I force myself to create something while feeling extremely uninspired, I usually end up being even more frustrated than before. I get angry with myself and at times I even destroy purposely what I just made because it didn’t turn out the way I wanted it to. That’s when I have to take a break as long as I feel the need to. What can help is doing something where you do not actively have to search for inspiration. What watercolors do you use for painting? Click here. This is where I talk about the watercolors I use.